Video Comparer is easy to use ! Check the folders to scan, on the left panel. You can expand the folders and check or uncheck some of them. To scan hidden files, enable the option in settings configuration window. To play a video, right click on the file name. Manually check or uncheck files to be cleaned. 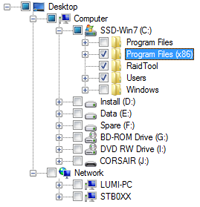 It is possible to uncheck all file names, by the Action button. 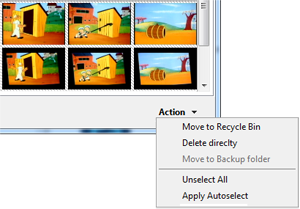 To clean files or to backup files, press Action, and select the action. 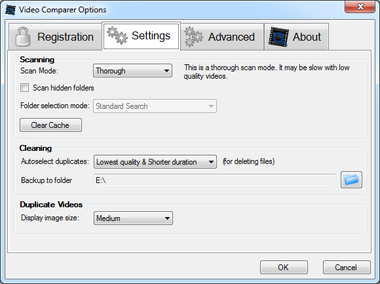 By default Video Comparer keep best video quality (image size & bitrate). You can change the auto selection method in settings configuration window. By default, the scan mode is standard. It is the best efficient mode for standard video. Some of videos can be badly encoded, and Video Comparer needs to spend more time to analyze these videos. The status is tagged ‘Required scan mode Thorough’ in Scanned Files tab. You can change the scan mode to thorough, but the processing time by video will be several minutes. Information used by Video Comparer are saved in a cache file. The next analysis will be faster !